Efforts by governments to promote sustained domestic economic development have been mixed. Success depends on many factors including location, geography, climate, external competition, human resources, natural resources, timing, political and governmental institutions, government capacity, implementation, leadership, values—and maybe luck. This complexity means that while development experts can often identify ingredients for success, few can prescribe the specific mix needed by a particular state to achieve sustained development over the long term. In Building Democracy and International Governance, author George M. Guess uses both case studies and careful data analysis to argue that federalist democracy may just be the most responsive, authoritative, and flexible system for nation building, and that there is value in confronting the challenges that lie in exporting federalist democracy abroad. Guess demonstrates the ways in which federation structures provide positive redundancy against failures, flexibility to change course and implement programs and policies, and state legitimacy and strength. 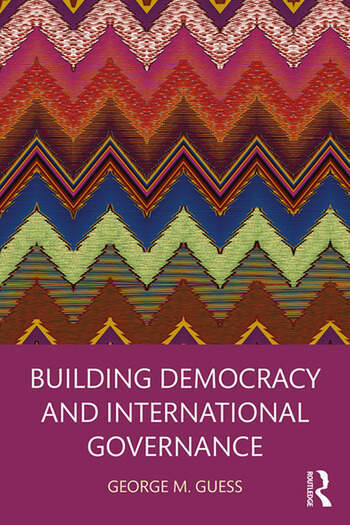 Examining twelve wealthy and developing countries from five regions, representing democratic and authoritarian government structures, confederations, and federations, this book will be of interest to those teaching graduate and undergraduate courses in Political Development, Democratization, Federalism, and Comparative Political Economy. George M. Guess is Adjunct Professor in the Schar School of Policy and Government at George Mason University, USA.